Innoxa's NEW Eye Shadow Compacts are long lasting and crease free palettes containing four coordinating shades to create a variety of looks from subtle to dramatic. This matte formula has been developed with pore-visible technology and contains anti-ageing properties that help to moisturise the skin and help minimise the appearance of wrinkles. Innoxa Eye Shadow Compacts are 100% fragrance free. 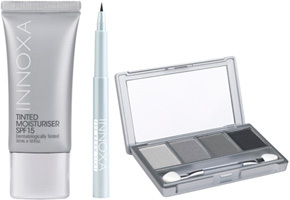 Innoxa's NEW Eyebrow Tints have a soft tip providing a feathery and precise application to create a natural eyebrow look. The water based formula glides onto the skin perfectly for easy application, creating a natural and long lasting effect without fading or smudging. Innoxa Eyebrow Tint is paraben free, ophthalmologically tested and suitable for sensitive skin. Innoxa's NEW Tinted Moisturiser SPF15 is a lightweight moisturiser offering a hint of colour with the added benefit o f SPF15 to protect against environmental damage. Containing Vitamin E, Innoxa Tinted Moisturiser SPF15 is hydrating and moisturising, leaving skin silky smooth. This product is the perfect alternative to a foundation for a natural, healthy looking complexion.